Wholesale sales rose 0.6% to $63.5 billion in January, a second consecutive monthly gain. Sales were up in five of seven subsectors, representing 70% of total wholesale sales. The machinery, equipment and supplies and the personal and household goods subsectors led the gains. In volume terms, wholesale sales increased 0.7%. Following two consecutive monthly declines, sales in the machinery, equipment and supplies subsector rose 1.9% to $13.3 billion. Higher sales in the computer and communications equipment and supplies industry (+8.5%) in January offset much of the industry's decline in December (-8.7%), while in volume terms, sales were up 7.9% in January following an 8.9% decline in December. The personal and household goods subsector rose for the first time in three months, up 2.5% to $8.9 billion. Sales were up in four of six industries, led by the pharmaceuticals and pharmacy supplies industry (+2.8%), which accounted for 53% of sales within the subsector. Sales in the building material and supplies subsector rose for the second consecutive month, up 2.0% to $9.4 billion in January. Sales were up in all three industries, led by the lumber, millwork, hardware and other building supplies industry (+3.3%). The motor vehicle and parts subsector recorded the largest decline in dollar terms in January, down 2.1% to $10.6 billion. The decline was attributable to lower sales in the motor vehicle industry (-4.3%), offsetting the gains in the other two industries. Sales in the miscellaneous subsector fell for the second time in six months, down 1.2% to $8.5 billion in January. Sales declined in two of five industries, with the agricultural supplies industry contributing the most in dollar terms, down 5.5% to $2.5 billion. In volume terms, the miscellaneous subsector declined 0.5% with the agricultural supplies industry falling 5.0%. Wholesale sales rose in seven provinces in January, representing 93% of total wholesale sales. In dollar terms, Quebec and Ontario accounted for most of the gain. Sales in Quebec rose 2.7% to $11.9 billion, led by higher sales in all subsectors. The personal and household goods subsector (+6.4%) contributed the most to the gain, following three consecutive monthly declines. The building material and supplies subsector (+3.2%) also contributed to higher sales in Quebec with its second consecutive monthly gain. 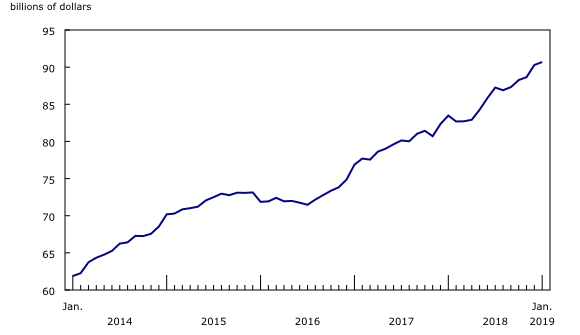 Following two consecutive monthly declines, sales in Ontario increased 0.8% to $32.4 billion. Sales were up in four of seven subsectors, led by the miscellaneous (+5.3%) and the machinery, equipment and supplies (+2.4%) subsectors. In Alberta, sales increased 1.8% to $6.9 billion, its second gain in six months. Higher sales in the motor vehicle and parts subsector (+7.1%) contributed the most to the increase. In New Brunswick, sales rose 7.7% to $579 million, more than offsetting the 2.5% decline in December. The food, beverage and tobacco subsector (+14.5%), which contributed the most to the decline in December (-8.6%), led the gains in January. Sales in Saskatchewan were down 10.7% to $2.3 billion, following two consecutive monthly gains. Overall, six of seven subsectors declined, with the miscellaneous subsector (-20.1%) accounting for the majority of the decrease after reaching its highest level on record in December. Wholesale inventories increased for the fifth consecutive month, up 0.4% to $90.7 billion in January. Gains were reported in four of seven subsectors, representing about 49% of total wholesale inventories. In dollar terms, wholesale inventories in the motor vehicle and parts subsector (+2.8%) posted the largest monthly gain, its fourth consecutive monthly increase. Two of the three industries within the subsector increased in January. Inventories in the personal and household goods subsector (+2.1%) grew for the second consecutive month. Overall, four of six industries increased, with the pharmaceuticals and pharmacy supplies industry contributing the most to the gain. Following three consecutive monthly increases, inventories in the food, beverage and tobacco subsector (-2.1%) posted the largest decrease in dollar terms. All industries were down, with the food industry contributing the most to the decline. The inventory-to-sales ratio was unchanged at 1.43 in January. This ratio is a measure of the time in months required to exhaust inventories if sales were to remain at their current level. 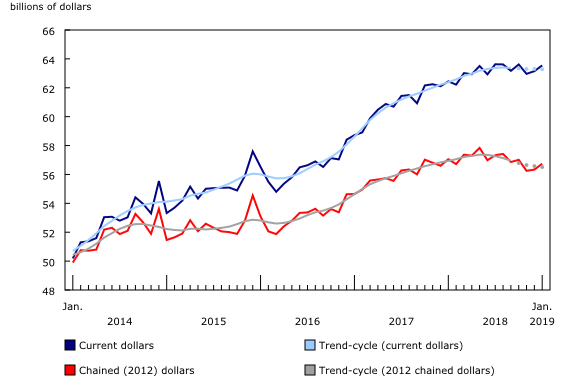 On March 15, 2019, Statistics Canada released new data on sales and costs of wholesale commodities sold. Data are now available for specific wholesale commodities, as well as totals at the national level. With these new data, data users will be able to better understand the types of products sold by Canadian wholesalers from 2014 to 2017. The data release will allow data users to compare the relative importance of various wholesale commodities in terms of sales and costs of goods sold, as well as see the change over time in the relative importance of wholesale commodities. Analysis of the new data is now available in The Daily, while the new data is accessible in two new data tables: 20-10-0014-01 and 20-10-0015-01. Effective with the release of the September 2018 wholesale trade estimates on November 21, 2018, wholesale sales estimates disseminated by Manufacturing and Wholesale Trade Division have been converted from a 2007 reference year to a 2012 reference year for its volume and price estimates. Constant price estimates and their associated price index are now using 2012 as their base year. Adopting a new reference year did not affect constant dollars sales estimates growth rates over the period from 2004 to 2011, as it represents a rescaling of the 2007-based data. However, levels and growth rates of the estimates for the period of 2012 to date have been affected by revisions to estimates at current prices and to price indices. The Monthly Wholesale Trade Survey covers all industries within the wholesale trade sector as defined by the North American Industry Classification System (NAICS), with the exception of oilseed and grain merchant wholesalers (NAICS 41112), petroleum and petroleum products merchant wholesalers (NAICS 412) and business-to-business electronic markets, and agents and brokers (NAICS 419). Real-time data tables 20-10-0019-01, 20-10-0020-01 and 20-10-0005-01 will be updated on April 1. Wholesale trade data for February will be released on April 23. For analytical information, or to enquire about the concepts, methods or data quality of this release, contact John Burton (613-862-4878; john.burton@canada.ca), Mining, Manufacturing and Wholesale Trade Division.